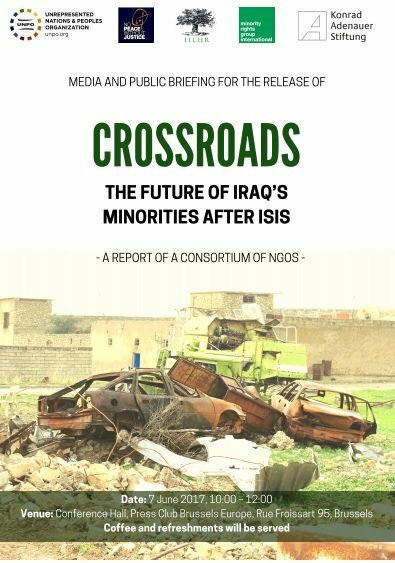 “Crossroads: The Future of Iraq’s Minorities after ISIS” documents how, despite the apparent pushback of ISIS forces from many areas until recently under their control, the future of Iraq’s minority populations is far from secure. Amidst competing land claims, the proliferation of different armed militias and serious human rights abuses by all parties to the conflict, minority groups – already decimated by terror even before the fall of Mosul – all indications point to a further persecution and discrimination for Iraq’s minorities once ISIS has been defeated. There is no apparent international or Iraqi effort to build the political, social and economic conditions for those expelled by ISIS to return to their homes. This report, based on extensive interviews and field research, fills this gap by providing practical information on the current state and future prospects of Iraq’s minorities, who include Christians, Turkmen, Yezidi, Kaka’i, Shabak and others. The report makes 63 specific recommendations directed at the Government of Iraq, the Kurdistan Regional Government and the international community that can address the grievous and growing humanitarian crisis, take steps toward helping victims and keeping perpetrators of crimes accountable, and build a sustainable political framework so that families can resume their lives in peace. The report is a joint publication of the Institute of International Law and Human Rights (IILHR), Minority Rights Group International (MRG), No Peace Without Justice (NPWJ) and the Unrepresented Nations and Peoples Organisation (UNPO). The report has been produced with the financial assistance of the Konrad Adenauer Stiftung. Details: The briefing will comprise presentations from all the speakers. There will be time available for questions and answers. Attendance: Please confirm your attendance by contacting Nicola Giovannini, NPWJ Press Office, at ngiovannini@npwj.org or + phone: 32 2 548 39 15.